The Numidians were from North Africa, around modern day Tunisia and Morocco. They were superb light cavalry and supplied large quantities of horsemen to their close neighbours the Carthaginians. 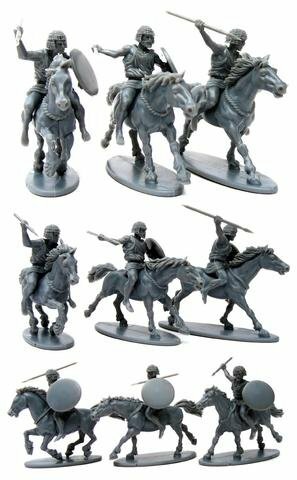 Numidian cavalry excelled in skirmishing, hit and run tactics. They would shower their enemy with javelin fire and run away to avoid contact and then wheel around again to pelt the enemy with yet more missiles. They were often used as scouts and in pitched battles would outflank the enemy and wait in ambush. They fought brilliantly for Hannibal during the second Punic wars, being major factors in his defeats of the Romans at the Trebia, Lake Trasimene and Cannae and they were also responsible for beating the Romans in Spain at the battles of Castulo and Ilorici under their charismatic and brilliant chieftan Masinissa. At the final Roman battle against Hannibal at Zama, some Numidians under Masanissa changed sides and fought for the Romans defeating their fellow Numidians under the leadership of the aged King Syphax. The Numidians helped swing the tide of battle to the Romans favour. Numidian cavalry fought as auxiliaries for Rome for many hundreds of years, they fought for Caesar and can be seen in evidence on Trajans column looking very much the same as they did during the Punic Wars.